Surveys often include questions about satisfaction. But what is satisfaction: an emotional response? all about comparisons? And what does it mean for user experience? This article, first published in the November 2012 UXMatters, examines what satisfaction means and how best to handle its complexity in a user survey. 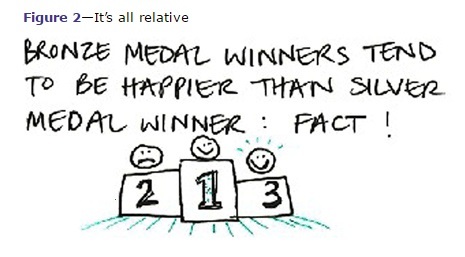 For example, bronze medal winners tend to be happier than silver medal winners, as depicted in Figure 2 and as described by Victoria Husted Medvec, Scott F. Madey, and Thomas V. H. Gilovich in their 1995 study, When Less Is More: Counterfactual Thinking and Satisfaction Among Olympic Medallists. “Winning any medal in Olympic competition is an amazing accomplishment. Folk beliefs suggest a linear decrease in positive emotions, with the gold medallists experiencing the most, followed by the silver medallists, and then bronze. However, in reality, [in Judo] the silver medallist loses the gold medal match, and the bronze medallists win their last match, capturing the bronze and avoiding going home without a medal…. Bronze medallists from the 1992 Barcelona Games appeared happier than silver medallists at the end of the match and on the podium, and … silver medallists’ comments were much more characterised by counterfactual thinking about ‘what might have been’ and were associated with greater regret and less enjoyable emotion.”— From D. Matsumoto and B. Willingham’s ‘The Thrill of Victory and the Agony of Defeat: Spontaneous Expressions of Medal Winners of the 35 2004 Athens Olympic Games’, from the Journal of Personality and Social Psychology, September 2006. 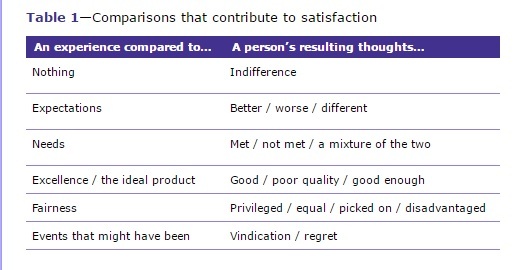 Richard L. Oliver delves into the varieties of factual and cognitive comparisons that can contribute to satisfaction or dissatisfaction, which I have summarised drastically in Table 1. He points out that, if you don’t process the experience at all, the result is indifference—not dissatisfaction. Let me tell you a story about a rather simple experience. Today, I’ve used a whole bunch of websites: I bought some stuff. I browsed some stuff. I checked the news. But the experience that stands out as memorable: signing up for a website to which I’m going to log my routes and training for a half-marathon. I expected it to be straightforward. Registering for a website should be simple these days. multiple contexts of use—while it was just me at my desk, there are so many different contexts of who I am as a person: beginning runner, UK person, UX consultant, supporter of a particular charity. It gives you preliminary data from the interviews that may be enough to move your project forward without the expense of an actual survey.